I’ve been determined to read more diverse books this year, rather than just stay with books and authors I know, and it has been enlightening and enjoyable. I picked up a copy of The Association of Small Bombs at NCTE when I was looking for potential texts for my Modern Classics course. Published in 2016, Mahajan’s book examines the complexities leading to and rippling out from a single bombing event in May 1996 in a crowded market Delhi. We learn of this event from the parents of victims, from the perpetrator of the event, and from people who were present. I particularly enjoyed Mahajan’s writing. In the first paragraph, he writes of the bombing, “a flat percussive event that began under the bonnet of a parked white Maruit 800,” and explains “a good bombing begins everywhere at once” much like a crowded market, which is mentioned in the next paragraph. This novel, like many these days, takes on multiple perspectives. We see into the victims homes as well as the terrorists lives, which humanizes them in ways that can make the reader uncomfortable. I enjoy books that make me uncomfortable, where the world is not black and white, but more of a complex gray. If you asked me to name a favorite character, I might choose Deepa, who negotiates the loss of her children along with her husband Vikas , but I was also fascinated by the way the characters’ lives intertwined, and so I would be hard pressed to truly choose a favorite character because they were so intricately connected. I enjoyed reading this novel because I haven’t read much Indian literature beyond Jhumpa Lahiri (everything she’s written) and Aravand Adiga’s White Tiger. If I were to be honest with myself, India is perhaps the country I am the least familiar with in terms of literature. So I googled myself a list, and realize I actually have The God of Small Things and The Inheritance of Loss on my to-read bookshelf. I plan to move these up on the list so I can read them sooner. 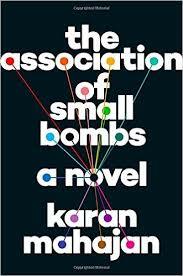 I would highly recommend The Association of Small Bombs for anyone looking for an interconnected story about the human condition, about why people do the things they do. Also, if you enjoy beautifully wrought prose, written with clarity and precision, this would be an excellent choice for you.